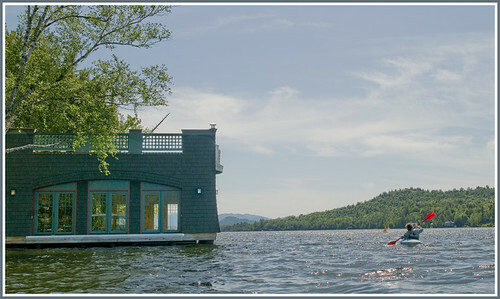 Earlier in the week we spent a few hours kayaking on Lake Placid. I was surprised at the boathouses on the lake. One after another, we paddled past beautiful structures built to provide housing for watercraft, often with a room or two above. But when I saw this one....all I could imagine was what a great space it would be for an escape. A studio perhaps. I love the windows all around, and the beautiful view in every direction. I know realistically, it's not weatherized and would be miserably cold during an upstate NY winter. But if it could be...I think I'd love a space like this. I'll keep dreaming. Wow...that IS a neat place. I'd figure out some way to keep it cozy in the winter...a woodstove, perhaps? Wow is right. That's a wonderful place. More insulation, double paned windows, a woodstove like Lisa suggested...there has to be something! Can we all come with you? What a simply beautiful way to display the lake views while providing necessary cover!